Students are welcome in the library to print assignments, use the Collection or simply chat until the school bell. It is open every lunchtime and prior to school starting. We have an extensive fiction, non-fiction, graphic novel, and Reference collection. E-readers are also available for loan. The Collection is accessible via Oliver from any computer at school or at home via the Digital Backpack. Online databases and Clickview are available through the Digital Backpack and Google Chrome. Students and teachers are encouraged to make suggestions about resources for purchase to add to the Collection. The comfortable lounge area makes the Library a welcoming space for students to use at lunchtimes to relax and read, borrow chess or board games, work on the communal jigsaws, read or simply talk with their friends. The Tuesday lunchtime book club is also a popular group. 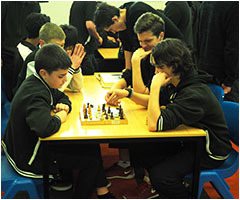 Chess club and chess competitions are also held in the library. The three classroom spaces are utilised by teachers for research lessons or by guest speakers. One of these spaces has IT facilities. The other has an interactive whiteboard. Our displays aim to keep students and staff up to date with important local events, news, new resources and databases and also to showcase students work. 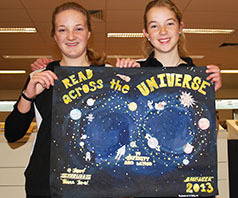 Book week is a highlight of the school calendar and an acknowledgement of the central place of literacy in our school. Students can borrow up to 6 items in addition to their textbooks. The borrowing period is 3 weeks. 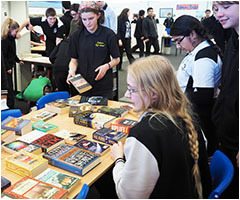 Students are also able to borrow texts for some subjects such as English and Maths. These items have a longer loan period. Borrowing from the Reference Collection is also encouraged. Loans must be made straight after school and are to be returned before next school morning. Orientation lessons in Year 7 introduce students to the Collection and the Information Literacy process. Library staff work closely with teachers on assignments to ensure that student work is aligned with Australian Curriculum requirements as well as developing our students' information literacy skills. Library staffs are available to assist students with locating resources for assignments, help with assignments, printing, borrowing and reading recommendations. Homework Help is available every Wednesday afternoon after school from 3.00pm - 4.00pm.